So you basically have a 1 ohm 40 watt resistor on the 5 volt rail? That's what you get if you put two in series (2 ohms) and then parallel them with two more, which drops the resistance of the four back to 1 ohm. Only difference is you get the benefit of 40 watts of heat disipation. You should get the same reading with just one, but it might get a lot warmer. NO, if you are talking about the 12 volt lines, but if you parallel the resistors as you imply you will get more on the 12 volt line. Theoretically, yes, because the result would be the equivalent of a 1/4 ohm 10 watt resistor, which would push the voltage up on all the rails slightly more than what you have now, but only by probably a few hundredths of a volt, and the resistor would likely get too hot and fail. The arrangement you have of resistors now is going to load the 5 volt rail about as much as you can load it, which will push the voltages up on all the rails, including the 12 volt rail, to just about their max. If you can't get as much as you need out of it with what you have, I'm afraid you may need to look for another source for whatever you're trying to power. Without major modifications, at 12.10 volts, it's giving you all it's got. i've followed all the instructions for the mod but can't get my PSU to start up. i've got the PS_ON green wire connected to a black (ground) wire, i've got the sense wire (light orange) attached to a orange 3.3v line and i've got a 10w 10ohm resistor connected to the red +5v line and to a black ground line. but get no joy! i've check the purple line +5v standby, that works and when i flick the switch i can see the fan twitch a bit, so something is happening. i've double checked for any other sense wires, but there aren't any. the 20 pin plug only has one pin with 2 wires going into it. anybody got any ideas on what else i can try? 1. 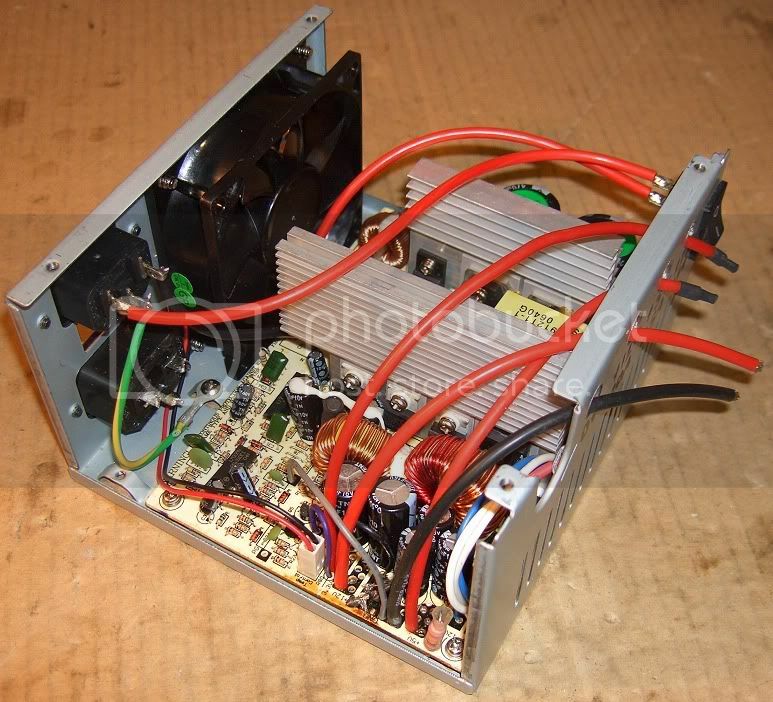 Do you know for sure that the PSU was functional before you began converting it? 2. Have you checked the unit for voltage output on the 5 & 12 volt rails, or are you just watching the fan? The PSU could be working, but the fan could just be bad. 3. Have you checked to make sure there are none of the other wires shorted to ground? Make sure the binding posts, if you have installed them, aren't touching the case of the PSU. Check the wires on the reisitor to make sure they aren't touching the case where it's mounted. The twitching fan almost sounds like it's trying to come on, but senses a short and shuts down. The twitching fan almost sounds like it's trying to come on, but senses a short and shuts down. This is the most likely senerio. Most "fan bumps" are indicative of a short, almost invariably to the PSU case. All rails, including the DC ground, should be isolated. The fan rotates a few degrees, due to initial current flow, then the overload circuitry captures and shuts the PSU down. Binding posts are usually the first place to check, but any other loose ends should be closely inspected. 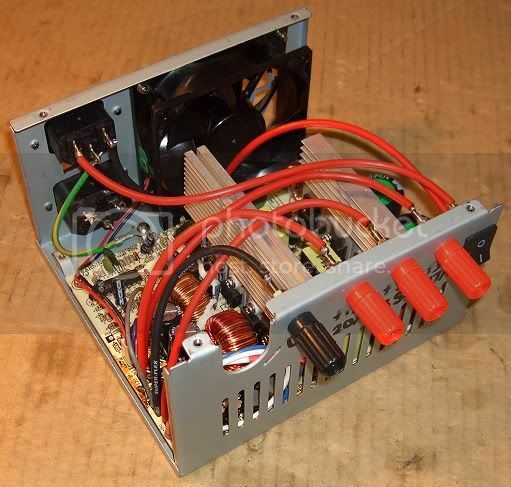 Guys I'm doing this mod but need some help... Its an older dell power supply like 200w, the 12v side is rated for 6amp I'm going to use it for a turnigy accucel 6 at most I'll ever pull is around 5amp.. I haven't cut any wires yet but using jumper leads I connected a 12v 55w (watt not amp) bulb to the yellow and black, I then jumped the grey wire to ground. Everything worked and the bulb lights bright however measured voltage across the bulb is 11.39vd shouldn't it be dropping 12v? Also jumper wiring in a 10ohm 10watt resistor on the 5v side does nothing to change the voltage dropped across the bulb or the brightness? Shouldn't it increase? I know measuring across the bulb is measuring the voltage dropped but it should be the same as the supply voltage since its the only consumer in the circuit? Tell me if I'm wrong but 55w/12v = 4.58 amps the bulb should be drawing? I would think that it should be able to do that and be right at 12v even? I tried to wire my meter in series with it and measure amps however when I do this the p/s won't start up, this is no matter if I have the resistor on the 5v line or not? edit, just tested with no load other than 10ohm 10watt resistor on 5v line, only getting 11.63v on 12v line?? Also my dell has one oragne pwr ok line that I don't have connected to anything... should I? If the PS is "rated" at 6A, you probably won't get that much out of it under the best of circumstances. There are a lot of factors that go into the reason why, but the bottom line is, if you need 5A continuous, you might want to shop around for a bigger PS to convert. "Since the signal is generated by the PS for use by the MPU, the PWR_OK (gray) wire should not be grounded, attached to any of the other output lines or tied to a resistor. It is not required for the PS to function its sole purpose is to allow the motherboard to initiate the boot process and to continue to function in the absence of unstable or improper power levels." No, because the purpose of the resistor is to load the circuit and force the regulator to push the voltage up a bit to try to get it closer to 12 volts. The bulb does the same thing, it loads the circuit itself. Additional loading won't make the PS produce more voltage. Your math is OK, but I'm not sure you realize that you will only be able to increase the PS output voltage slightly by loading it with resisotrs, bulbs, etc. If the supply is designed to produce 12 volts, you said you measured the output of your as 11.39. So we're chasing roughly an additional 6/10ths of a volt. And all this is assuming your meter is that accurate. If your meter is off by, say 3/10ths, then we're really only looking for another 3/10ths. Believe me, you'll never miss that extra voltage, if you ever get it you won't know you had it. It won't make any real difference to your charger. Make sure the current can flow through your meter in the same direction it flows through the circuit, from negative to positive. Otherwise, no current will flow. So now we're within 4/10ths, maybe the amount your meter is off? Leave the resistor on the 5v rail. And you might want to find that green wire, if you have one, and connect it to a black wire. If the unit comes on, latches on (stays on), and is producing 11.63 volts, you just need to charge something! Your battery charger should have no trouble with that unless you ask it to charge at a rate in excess of about 5amps. Thanks DM, I think Im' gonna leave it as is and see how the charger works with it..
As far as the grey wire, for my dell that is the activation wire so I had to wire it to ground (switched now) to get it to turn on.. I don't like the heat coming from the two resistors so I might give the 4, 10watt 1 ohm resistors a try.. If his DELL PS was manufactured during the time frame where they did not follow the typical industry color codes, his gray line may in fact be his PS_ON lead. DELL's deviation from the norm contributed to a number of motherboards being smoked when a standard ATX PS was plugged in - quite unfortunate since the 20 pin plugs were interchangable, just wired differently. I've attached a link to the page with the DELL pinouts commonly found from 1996 to 2000. As David pointed out, your meter may be slightly off or your PSU may simply top out at 11.6. You might be able to push it a little higher by using two 10 ohm resistors in parallel since this will give a 5 ohm load. If you see little or no improvement, dropping the resistance further will only produce more heat and load the PSU. Most chargers will run with 11.6v. I knew if you could get Andrew in on your question, you'd get the correct info. Sorry I mislead you on that gray wire, I haven't run into that even though I think I've converted some older Dells, but I can't remember for sure. As I have said before, Andrew is the "guru", the oracle of PS conversions, the LAST WORD on this subject. Whatever he says, go with it. tried about everything still can't get the PSU to latch on. i've double checked i haven't shorted anything, don't think thats it. i've tested the 5v standby line, its working, i powered up a fan with it and measured 5.1v on the multimeter. so i'm presume that means the PSU does work. i tested the green power on line before grounding it, it measured 4.1v on the multimeter. so power on line is good. when i ground the green power on line, i measured the voltage of the 5v and 12v lines, it jumps up slightly, less than 1v but then becomes totally dead. the red 5v line has been loaded with a 10w 10ohm resistor. is there any other diagnostics i could run? could it be i don't have enough load? would it help loading the 3.3v and 12v lines? pretty much out of ideas, otherwise this PSU is going to become junk. Thanks guys, I got it all wired up last night, seems to be working.. I took it to work and used my good dvom, measuring amps though its only pulling 3.7amps?? I'm confused as the headlamp bulb I'm using is a 12v 55w bulb? If you use w=v*a taking 55/12 =4.58a?? The p/s is rated at 6? So shouldn't I be getting 4.58a out of it? for testing I went and soldered 3, 12v 21w auto bulb in series, shouldn't this give a total wattage of 62w? when I tested them the amperage went down to like .98 amps? 4.76amps at 11.48 volts with no 5v load, I then loaded the 5v rail with one then two 10watt 10ohm resistor the difference it made was it took voltage up to 11.5v... To me I don't think the resistors are worth the added heat / strain on the supply for .02v? Why does the amperage change? Running parallel dropped the resistance right so more amps could flow, but when I tried a single 12v 21w bulb it only pulled 1.4amps? Also I wired in a led to the power ok line (orange on my dell) with a 220ohm resitor and the light is actually very dim... the line puts out like 4v and the led is 2v, I don't have any other value resistor, if I wire another 220ohm in parallel would that work to let more current through and make the led brighter? What color is your LED? Different color LEDs have differing forward voltages, and that will determine the correct resistor value for yours. If you know the forward voltage of yours, here's a handy little LED calculator I use often to calculate the right resistor for any LED. If you don't know what your LED's FV is, the color will give you a clue. Most likely, your resistor should be down around 100 ohms to make the LED operate at around 20-25 ma, so putting a second one in parallel should do the trick. As for your headlamp bulb, a car's electrical system actually operates at about 13.8 volts DC. That's what the alternator produces to run the system and keep the battery fully charged, so if you insert that voltage into your equation, you'll see that a 55 watt bulb should only draw around 3.9 amps, very close to the reading you're getting. I'd chalk the difference up to differences in the manufacture of the bulbs, or maybe an old bulb. You might try connecting that orange sense wire to a different orange wire. I seem to remember that I converted one once that behaved that way. I think I finally decided that there was something about one of the 3.3 volt rails (orange) that was different, and that the sense wire had to be shorted to just the right orange wire to latch the PS on. I now mark any two wires that are connected together in the plastic connectors before I cut them off so I can get them back together correctly afterwards if I need to. You might try that, Andrew can tell us if that's even a possibility or not. I could be completely wrong about it, but it wouldn't hurt to try it. It says 100ohm should be perfect for mine so 2, 220ohms in parallell should be 110ohms and work ok.. I just wanted to share the PSU MOD to all of you..
this is my second revision, the first one i use intel pentium 2 big heat sink plus additional fan, so it's kinda messy, so i rework it. The PSU i use is 450Watt ATX PSU from OKAYA (never heard of this, but it's really cheap, i got it for Rp.95.000,-, it's same as 9.04$ at rate of 1$ = Rp10.500,-, i live in Indonesia btw). The PSU have a really poor quality, but i only want to try the mod so i just get it. The drawback of using the smaller heat sink is the power resistor is getting really hot (i didn't measure it though, but i think it's just me, because i can't stand heat as much as others). The first bigger heat sink (intel pentium 2 heat sink, but sorry dont have a chance to take a picture of it) with it's small fan is still getting hot, but by add a large fan the heats get fade in fast. But still, using the smaller heat sink + some thermal compound between them + hoping the external unlimited air supply will get coll the power resistor fast enough. Beside, even IF the power resistor gets burned downand got cought with fire (like that's going to happen? ... Can that really happen???) it will be notice fast enough to take an action (like shut it down etc.). I haven't test it with load yet, i don't have any chargers yet, but i thest is with some 16v bulb (4X 4v bulp in series) and it turn on, so i quess the PSU is really working. I'm giving some of the pictures, so give me some opinions + suggestion and i hope this design can inspire the others when converting their PSU. Thanks also for this threads, because without it i can never try and finish this kind of PSU mod. Thank you very much everbody. NB: the PSU looks blacky because i tape it with some black thick tape to prevent me get shock when moving it while the PSU is ON. Here is an automotive 12V 60/50W headlamp that i use as the load (Please ignore the headlamp case, this is just a usualp or original headlamp). 2. using the headlamp with the power resistor give me more power, but thats probably going for too much of load. 3. 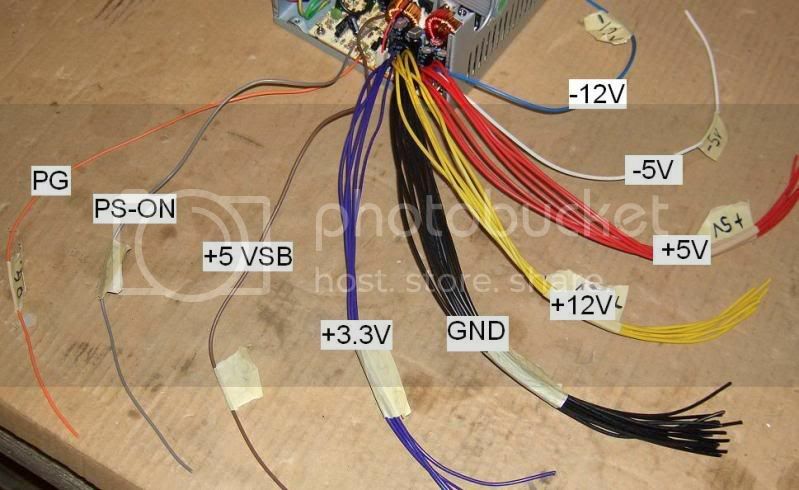 The last is that i think, when converting a PSU for RC user is just going to use it as a power supply for battery chargers, so i quess that using alot (or all) of 5V wire (i have 6 wires) instead of only 1 red wire and connect it with the power resistor/ load can give more voltage on the 21v line. In other words, i think i can desolder all the small gauge wire (mine use only 20-22 AWG wire) and replace them with some 10 AWG or thicker wire could geve morte voltage. Ok, then i hope this sharing can help anybody that wanted to try the MOD. - the other wire (white, purple, grey, etc) wont be needed for the MOD. If you are planning to use one of these PSUs to power a battery charger that will pull several amps, I strongly recommend you use more than one yellow wire to provide your 12 volt output. I'd use at least three yellow and three black, to ensure they can safely handle the current without overheating. Basically, the more you use the better. Replacing the wires with bigger gauge wires will not increase voltage readings or improve the PSU's output. The voltages are regulated and can only be increased slightly by introducing a load on the unit, to some extent the greater the load (in the case of the bulb it's actually impedence) it introduces into the circuit, the higher the output will go, but only to a point. The few tenths of a volt you're trying to squeeze out of the PSU won't make your battery charger perform any better. The headlight bulb may increase the 12 volt output somewhat because it places quite a load on the unit, but the current you are using to power the bulb is current you no longer have available to run your charger. Just go with a power resistor on the 5 volt line and be satisfied with whatever you get. If it's close to 12 volts, you're good to go. As to the sense wires, they may or may not need to be connected depending on the PSU. Do what works. how do i check dc amp? PS looks like 2x PSU sandwitched toghter with allot more cables !!! I thought I'd show off what I did to my PSU. Since I'm not going to be running my PSU without a load, I don't know why I would, I havn't bothered fitting a power resistor etc, nor any additional switches or LED's as some others have around the web. The next photo shows near completion, just waiting for my four binding posts to arrive. I have gone for Ground, +12V, +5V and +3.3V. You will notice that I have stripped out all the wire bundles and replaced them with some nice, large gauge silicone wire. You will see that I have got rid of the Brown and Orange wires while I have connected the Grey wire to the Ground and the isolated Purple wire(not connected to other Purple 3.3V wires) to the 3.3V connection point. I have also relocated the power switch to the opposite corner to make it more accessible and convenient. Job done and works a treat. I tried one and the fan runs. I put an automotive light socket with 1156 bulb on it....It turns on, fan is on, light is burning bright, BUT as soon as I hook up a charger, it all shuts down....I cant figure out what is going on....green wire to a black wire, grey wire to a red wire, 3 yellow wires for the +12 volts and three black for the negative..the light is on 1 red wire, +5 volts and a ground wire...Any ideas? Apart from your bulb how does your wiring compare to mine? .....BUT as soon as I hook up a charger, it all shuts down....I cant figure out what is going on.... grey wire to a red wire .......Any ideas? The grey wire does not need to be attached to any other line. Attach your charger before powering up the supply. Once stable, the PSU treats the charger as an internal short on the motherboard and powers off. These PSU's are designed to powerup with a heavy capacitive load, but not to remain on when a heavy load is connected.